​​​​​ HOUSTON – The new Barbara Jordan High School for Careers building's footprint is almost finished. 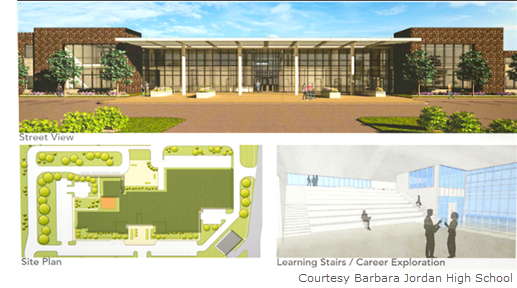 The 120,000-sf career center, 5800 Eastex Fwy., will accommodate 600 to 800 students. The first floor will consist of administrative, cosmetology, marketing, and culinary spaces, and large shops for construction, auto/diesel, and welding. The second floor will contain the health science wing and math classrooms. Jordan's $42.4 million construction project is a part of Houston Independent School District's voter-approved 2012 Bond Program. The building will be fully enclosed by the end of May 2018. Building construction is slated for completion in fourth quarter 2018.